my bare cupboard: Ultimate chocolate-espresso brownies "
I've just written a long post and been downloading some software but when I restart the computer , it was all gone ackkkkkkkk ! Automatically saved , my foot ! Man , 'twas really difficult keeping my grubby paws off these brownies ! These brownies are really good and addictive ! Sadly , my camera just can't recognized the purple color ! Have you tried any recipes from America's Test Kitchen ? * Preheat oven to 350°F / 180°C . Line an 8-inch square baking pan with foil and lightly butter it . * Melt chocolate , butter , espresso and cocoa powder together over a pan of barely simmering water , stirring until melted and smooth . Let cool slightly . * In a large bowl , whisk the sugar , eggs , vanilla and salt together . Whisk in the melted chocolate mixture until combined . Stir in the flour until just incorporated . * Scrape batter onto the prepared pan and smooth the top . Bake until toothpick inserted in the center comes out clean with just few crumbs attached , about 35 to 40 minutes . * Let brownies cool completely in the pan , set on a wire rack , about 2 hours . Cut into squares and serve . Thanks Anne, those three pieces of brownies will be good for my family of three, although I don't make ice cream at home but for these I will. Anne, Your brownie looks perfect. Anymore left to share with me? I can see beautiful purple , don't complaint your camera , she did a good job, hehehe..perfectly done brownie ! 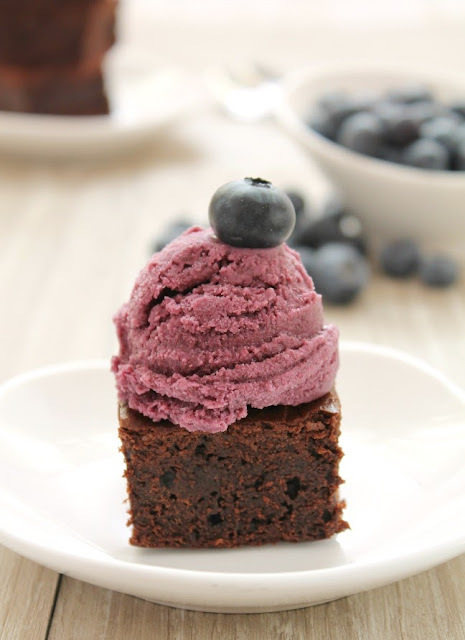 I think brownies and a berry icecream would go wonderfully together! Oh wow such decadent brownies... I love that pix of the gelato and the brownie... that is what I would have ordered for myself! i actually thought it was purple until you mentioned raspberry pink! i still think it is a beautiful colour! btw, recently i drafted a post too and it didnt manage to save automatically, i then realised that i got to put in the title of the post first, otherwise it couldnt save..so funny! Anne, your brownies looks sinfully chocolaty yummy! Having it with ice cream, I could have seconds! No, I have not tried baking from The America Test Kitchen Baking Book, but have read so much about it, and it is already on my wishlist for ages! Haha! Haha Anne! My advise is to cut it even smaller!!! Haha! I so understand what you mean! I always have to resist the urge to just tuck in after I've made a meal. I annoy the hell out of some of my friends too because it's always camera first! Ha! The brownies look wonderfully dense and fudgey and delicious, no wonder you couldn't resist! Yum! And the photos look great; don't worry! These brownies look sinful. I think they also look beautiful with the blueberry gelato. Wow what a flavor explosion. I'm not sure which sounds best the gelato or the brownies! What do you think? Absolutely decadent and irresistible, Anne. Computer restart? I will be like you... can't wait, must enjoy these brownies first. Camera not getting the right colour? I will eat the ice cream off the brownies and take pictures of them being naked - LOL! I have not tried cooking or baking anything from the American Test Kitchen yet. Now you make me wanting to buy this book. 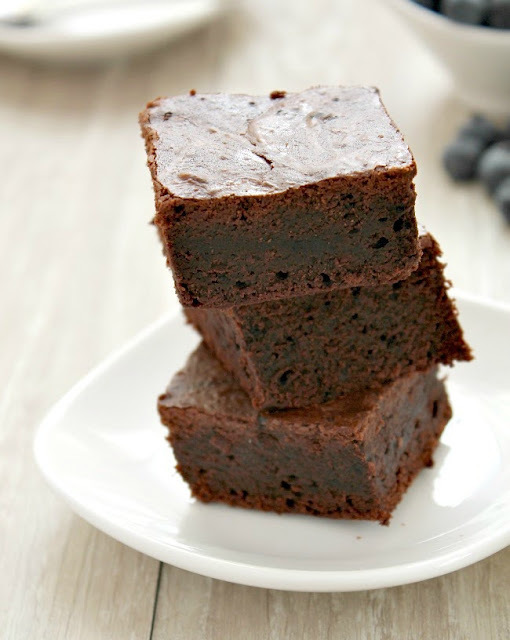 I must try this brownie recipe...so thick and luscious! Perfect with your blueberry ice cream, no matter what color it appears!!! Aw, I hate when that happens. Definitely annoying when it has not saved my work. These brownies look to DIE for! I love this! Hi Anne, love your brownies, so chocolatey and awesome. I don't mind to have 4 pieces, please. Oh... and a double scoop gelato too. hehehe... Nice click, it look good to me.